This, my friends, is a picture of a 1992 Mitsubishi Expo LRV. That stud-like dude in front of it? Yeah, that's an 18 year-old me. 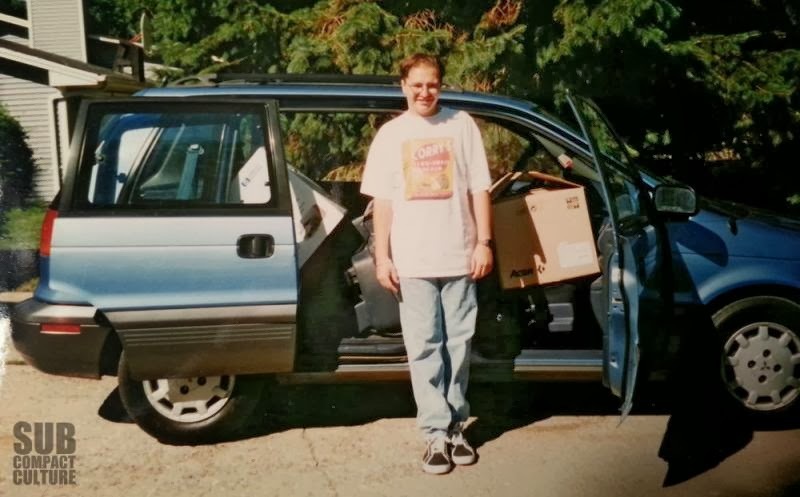 It was 1996 and I'm about to go away for my freshman year of college. The car was a much-appreciated hand-me-down, which was on loan from my mom. This vehicle taught me lessons in frugality, practicality, and travel. The Expo LRV was inexpensive to fuel, could hold a ton of stuff, and gave me the ability to see the world on my own. I was extremely fortunate to be able to bring a vehicle to college, especially since I was in rural Wisconsin. This car gave me the chance to get the hell out of Dodge, or in my case, Menomonie, from time to time. Although I really wanted a Volkswagen GTI back then, I knew I was very lucky to have any vehicle at all. In many ways the Expo was the perfect college vehicle. It was small and easy to park. Its rear seat could be folded forward or completely removed to haul stuff. It was new enough to be reliable in the frigid Wisconsin winters, but was wasn't so new that I worried about it when it was parked a mile away in the remote parking lot. Being a "car guy" through and through, sometimes I felt like I'd been saddled with the Mitsubishi "Pregnant Roller Skate" instead of something perhaps cooler. I remember thinking I should sell it and get something else. I was typically reminded that this wasn't, in fact, my vehicle, and that it still belonged to my mom. But, I almost ended up with a 1987 VW Sirocco 16V instead, which would've been awesome, at least that's what I remembered thinking at the time. My mother was going to trade in the 1994 Mitsubishi Eclipse GS and the 1992 Expo LRV on a new 1997 Montero Sport, since the Eclipse wasn't terribly practical and was not good in the snows of Minnesota's winter. The VW was cheap, and I loved it, but in the end, it didn't work out thanks to a broken heater and sky-high insurance rates for an 18 year-old. She did trade in the Eclipse on the Montero Sport, and I still kept the Expo LRV. So close. Eventually, I ended up truly embracing the Expo LRV for what it was. I started a Geocities site (remember those?) called The Expo LRV Pages and even ended up with a message board and a decent following. After connecting with others from around the world, I ended up putting a custom cat-back exhaust on it; a modified airbox with a K&N intake; some custom hubcaps (yes, hubcaps—hey, I was in college! ); and a big, loud stereo which was stolen not once, but twice. Eventually the Expo started to nickel and dime me, and I ended up trading it in on a 1999 Nissan Sentra SE Limited with the renowned SR20DE engine. But I remember the first time I tried to put my bike in the car, I gauged the upholstery. Man was I pissed! I remember thinking that the Sentra, as fun and sporty as it was, was not nearly as practical as the old Expo LRV. Six years and several other vehicles later, I ended up with a 2005 Scion xB and realized how darn practical that Mitsubishi Expo LRV was, since the xB had many similar qualities and even similar dimensions. Of course, now I want another Expo LRV, which I'd love to drop a 4G63T engine from an Eclipse or EVO into. Someday! That little Mitsubishi wasn't too expensive, it was good on gas, and it was possibly the most practical vehicle I've ever owned. It'd still be a great car for a college student, so long as you can get parts for them. Then again, these days, it's probably be better to find a used xB or xA; a Yaris, Honda Fit, or Nissan Cube or Versa. But back in the early 1990s, the Expo LRV and its Eagle Summit Wagon/Plymouth Colt Vista were hard to beat as a college car. I always thought those were cool; I found one in a junkyard once and that was the first one I'd ever seen. It was pretty crazy that hwen you opened up all the doors you could practically drive a motorcycle through it. I also remember the bizarre folding window cranks. All in all, I would rock the hell out of one. I would think a vehicle similar to these with modern powertrain and safety features would be a big seller! The Scion, Cube, and Soul are close, but are still too cookie-cutter for me. For all of you that didn't know me when I had this vehicle, I did have a shift knob made out of an old billiards ball (it was a blue two ball that matched the car). I just bought a '92 Expo LRV. Although, I'm already regretting not buying the '90 Corolla wagon that I test drove. The Toyota was in much better shape, but the asking price was also a bit more. I loved the "personality" of the Expo, so I sprang for it. It didn't pass emissions, and now it won't even start! I think the ECM is toast. I'm debating if I want to keep throwing money at the car or just bite the bullet and scrap it. When it was running, it ran great. I think the ECM may be the achilles heel for these old cars. I'll probably end up keeping it and just ponying up for the hard-to-find parts for it. I like practical/unusual vehicles. However, I appreciate reliable vehicles even more. Hopefully, I'll be able to chase the gremlines out of this thing so it'll be ready for another 240K miles. I've been driving a "95 Expo since 1998. I LOVE this car. However, the transmission has now gone. I'd love to find someone who will put in another transmission and wants the car. It is otherwise in very good shape (no dents, rust, very good paint, good interior, engine with only about 90,000 miles, rest of the car 135,000. New brakes, 2 year old timing belt with about 10,000 miles, etc.) I don't want to see my wonderful car go to be parted out or end up being scraped. Please contact me at openingenergy@earthlink.net if you or someone is interested in keeping this practical beauty on the road. I bought my first one, 1992 Eagle Summit DL (220K kms)at an auction. Overall good shape. I bought my second one, 1993 Dodge Colt AWD (275K kms)about a year later. Problem with TCM but found one on ebay. I bought my third, 1993 Plymouth Colt AWD (468K kms), found when looking for parts. Bought two 1994's from auto wrecker when found as I knew parts would become obsolete. Ok now I have an addiction! Oh hey! There are two models I don't have!! Not for long. #4 is a 1994 Mitsubishi Expo (180K mi) I found in WA state. #5 is a 1994 Mitsubishi Expo LRV (79K mi) I had to fly down to Palm Springs CA and drive back to Abbotsford, B.C. Why five of them you ask? Because they are fun to drive!! Very unique, great little haulers, and are an endangered species. All of them are licensed, look good, no rust and run very well.